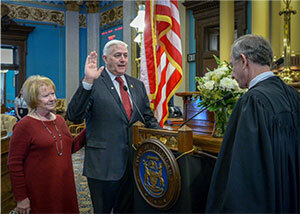 We have formally begun a new year and a new Legislature. While I hope everyone enjoyed the holiday season, and had some much-deserved time with their families, my new colleagues and I are ready to get back to work serving you in Lansing. If you have any questions or concerns, please feel free to contact me at SenKHorn@senate.michigan.gov or toll-free at 855-347-8032. Or if you are in Lansing, please feel free to stop by my office, room 7200 in the Binsfeld Office Building. I look forward to meeting with area residents and hearing concerns that any residents of the district may have. Please feel free to drop in. No appointment is necessary. Earlier this month, I had the privilege of being formally sworn in to represent the 32nd District in the Michigan Senate. My wife Veronica was at my side as Michigan Supreme Court Chief Justice Stephen J. Markman administered the oath of office. Now that the 100th Legislature is up and running, I look forward to working with my new colleagues, and our new governor, to continue Michigan’s tremendous comeback. I'm excited to announce that my committee assignments for this term have been released. I'm going to chair the newly formed Senate Economic and Small Business Development Committee — which is a combination of the Economic Development and International Investment, Commerce, and Michigan Competitiveness committees from the previous term. I will also be chairing two Senate Appropriations Subcommittees, Capital Outlay and Talent and Economic Development/MEDC. I’m eager to continue my work to reclaim Michigan’s status as an economic powerhouse. In my last four years as chair of the Economic Development and International Investment Committee, my colleagues and I were extremely successful bringing autonomous vehicle development to the state, creating incentives for cities to redevelop some of the state’s biggest eyesores and contaminated sites, and shining a strong spotlight on career options for students. Additionally, I will serve as vice chair of the Senate Committees on Education and Career Readiness; Energy and Technology; and the Universities and Community Colleges Appropriations Subcommittee. I'm also a member of the Insurance and Banking Committee. With these committee assignments, I hope to play a key role in the areas of education and career readiness because Michigan’s regrowth must include filling our talent shortage, and educational opportunities for students are key. 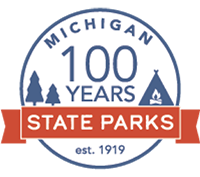 Michigan has a deep and rich economic history. Joining the forces of economic development and education will breathe new life into our cities and throughout our state. The Michigan Department of Treasury recently shed light on a new tax scam that has become a problem for businesses throughout the state. As we approaching another tax season scammers are once again ramping up their efforts. I encourage companies to review procedures for handling protected information and make sure all employees follow protocol and do their due diligence when doing so. I want to thank Treasury for making people aware of this scam, and I hope spreading the message helps protect as many Michigan businesses as possible. 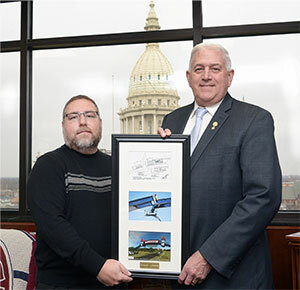 I recently had the pleasure of welcoming Jay Wheeler, vice-president and director of civil engineering at William A. Kibbe and Associates to my Lansing office. Jay presented me with a framed copy of the Palmer Gateway Arch blueprints. I am honored to be one of only three people to receive these. The other two copies went to the City of Frankenmuth and the Palmer Foundation. I want to thank Jay for stopping in to see me and for this tremendous gift that will remain a staple in my office for years to come. The newly completed archway looks great and is surely welcoming to folks visiting my hometown. Higher-than-expected tax revenue generated by Michigan’s healthy economy allowed the Legislature to direct additional funds to some important projects late last year. $20 million to hire more Child Protective Services workers. The new investments in transportation, public safety, schools and other areas will help improve the lives of all Michigan families. The spending bill is now Public Act 618 of 2018. Substitute teachers are in short supply in Michigan. In fact, the discipline is included on the state superintendent’s critical shortage list. Legislation now signed into law makes more substitute teachers available in difficult-to-fill areas and improves public education. Public Act 418 of 2018 allows individuals with professional credentials and career expertise to substitute teach in a career tech education program. It also allows individuals younger than 22 years of age to substitute teach in high school; many student teachers are less than 22 years old and perform well. The new law takes effect on March 20, 2019. 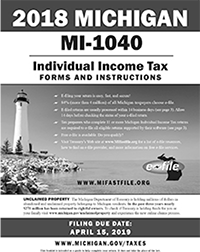 While Michigan’s individual income tax season begins in late January, taxpayers can get a head start on viewing and downloading the state 2018 tax year forms and instructions at www.michigan.gov/taxes Taxpayers can e-file their state returns when tax season begins at the end of the month at www.mifastfile.org. The Department of Treasury reports that 84 percent of all Michigan taxpayers choose to e-file. Tax officials also note that commonly used paper forms will continue to be available at Treasury offices and most public libraries. Thank you for subscribing to my electronic newsletter! I am honored to represent you in the 32nd Senate District of Michigan. Please feel free to forward this on to others who may be interested in receiving the 32nd District E-news. You may sign up for it also at my website.